Rhampholeon brevicaudatus is a species of chameleon mainly found in different regions of Tanzania. 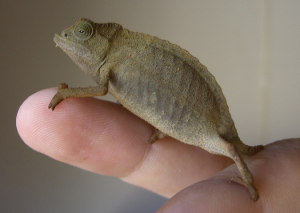 These reptiles are also known as Bearded Pygmy Chameleon or Bearded Leaf Chameleon. The Rhampholeon brevicaudatus has a “beard” below their mouth which distinguishes them from other chameleons in the Rieppeleon genus. This species have a less colorful appearance compared to other chameleons. Size: These small reptiles can grow up to 8 cm (3 inches) in length including a 2 cm long tail. 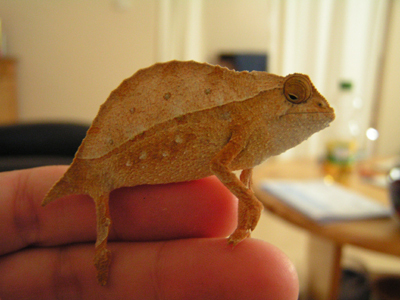 Body: Male Bearded Pygmy Chameleons have a thinner body than the females along with a longer tail. Their dorsal crest is also more prominent than the females. Sometimes, they compress their body laterally producing stripes down their sides to mimic a dead leaf. Color: Like other chameleons, they can change their coloration. These chameleons usually appear brown or tan being able to adopt various colors including yellow, orange, green and black. Head: They have a small beard consisting of some raised scales below their mouth. These chameleons have a pair of independently rotating eye-sockets and a long tongue. They can be found in the Uluguru and eastern Usambara mountains in the north-eastern regions of Tanzania. They live in the evergreen rainforests in Tanzania. These small reptiles prefer shrubs and low brunches at elevations up to 1300 meters. These pygmy chameleons usually feed on various types of insects including crickets, moths, wax worms, wingless fruit flies, small locusts and mantids. This species is generally active during daytime. They often mimic dead leaves by compressing their body while sleeping in open areas. The chameleons of this species often change color in order to blend into their background. They are known to change color during courtship as well as to show their emotions. Different snake species like the Vine Snake and the Boomslang Snake are among the principal predators of this species. Various birds including shrike, hornbill, coucal and hawk are also known to prey on these pygmy chameleons. They can mimic dry dead leaves making it hard for the predators to find them. These reptiles also use their ability to adopt vibrant colors for intimidating their potential predators. They can avoid predation by changing their color and blending into the background. Their independently rotating eye-sockets make it easier to detect and catch preys. These chameleons can hunt easily using their incredibly long tongue. This species becomes reproductively mature between two to three months of age. They can reproduce all year round. Female Rhampholeon brevicaudatus can retain sperm. The females dig holes to lay the eggs in them. Each clutch contains somewhere between 4 and six eggs. The average lifespan of this species is between 3 and 5 years. The Bearded Pygmy Chameleons are a popular choice of pet as they are not poisonous and it is quite easy to take care of them. They can be housed in pairs with one male and one female or as trios with one male and two females. This species can be great choice for those with little experience of keeping chameleons. They can be very interesting as pets being great fun to watch. Housing: A 10 to 15 gallon tank is adequate for a pair of these chameleons while trios can be kept in a 20 gallon tank. The substrate of the tank should consist of a 3 cm thick layer of soil and a layer of coconut fiber and tree bark. It should be deep enough for the female Rhampholeon brevicaudatus to be able to dig holes for laying eggs. Temperature: The temperature of the tank should ideally be somewhere between 70 °F and 80 °F during daytime. The ideal nighttime temperature should be around 65 °F. It is not recommended to let the temperature go anywhere beyond 80 °F as that will result in overheating which might even cause the death of these pygmy chameleons. Humidity: It is ideal to keep the tank humidity around 70% by using two heavy mists per day. Lighting: Normal fluorescent or halogen lightings can be used as they are beneficial for these reptiles. It is not known whether UV lights are especially beneficial for them; however one can use UVA or UVB lights as they are not harmful. Feeding: One can feed them with a wide range of insects including crickets, worms and flies. Their diet should mainly consist of small crickets. They can occasionally be provided with wax worms and silk worms as treats. 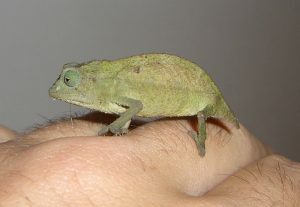 Adult Rhampholeon brevicaudatus chameleons prey on larger insects than the juveniles. Handling: Like any other chameleon species, they should not be handled unless necessary. Temperament: These chameleons are quite peaceful in nature. This species derived their name Bearded Pygmy Chameleons from the beard-like formation on their chin. The tongue of a Rhampholeon brevicaudatus is usually longer than its body. It is a common misconception that they use their ability to change their color for camouflage, but actually they use this color changing ability for courting and showing emotions. Their color darkens when they are under stress. Rhampholeon brevicaudatus populations are lessening in number due to various reasons like loss of habitation and de-forestation. 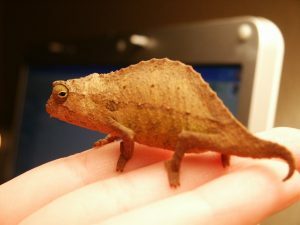 Rhampholeon brevicaudatus is an amazing species of chameleon with interesting appearance and behaviors. They also make good pets. It is the duty of humans to conserve their population in their natural environment.